Beds are chosen for a variety of reasons and while style and design certainly play a large part of the selection process, what trumps that has to be comfort. For many people there is nothing more comforting at the end of a long day than retiring to the private sanctuary of their bedroom and sinking into their beds. Not only do we want our beds to be aesthetically pleasing and to match our design style, but we want them to be a place of relaxation and comfort. 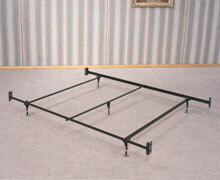 At DCGstores.com we've done our best to bring together a huge selection of bed types and styles. We carry everything from twin size beds to king size beds and even offer simple bed frames if you've already got a headboard decoration in mind. We want you to feel the most at home in your bedroom and feel confident that with the selection that we offer here, you are absolutely certain to find the bed that exactly suits your need. 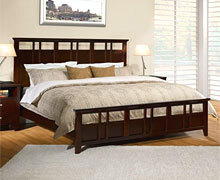 We also carry beds that are perfect for guest rooms and children's rooms as well. One of the earliest form of beds were the pallets – these were typically low raised bed frames upon which sat mattresses of fur or straw, leaves and other fillers. The importance of the early bed was the realization that raising one off of the floor when they slept was a good idea. This kept a sleeper away from bugs and vermin while they were asleep and also lifted their bodies from floor which was often cold and drafty. 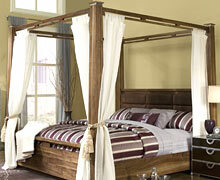 These first bed frames were simple and made of wood and rope or sometimes stone. As the use of these sorts of frames became more common, the bed frames themselves became more ornate depending upon how wealthy the owners were. 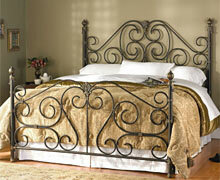 Early in the 13th century luxury items became paramount and bed frames began to become more ornate. They were often carved, painted or gilded with precious metals. Sometimes they were inlaid with metal, tiles or even gemstones. The mattresses improved as well, going from leaf and hay to feathers, offering a great deal more comfort to the sleepers. 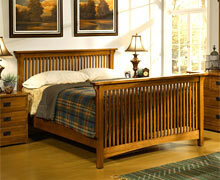 Wood became the standard for bed manufacturing until the 18th century when iron became popular. In fact, iron was touted as safer as it promised to be free of wood-boring bugs and insects that were attracted to wooden frames. 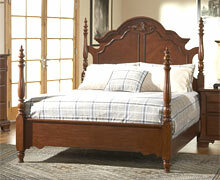 These later beds and the ones that followed are the ones that are closest to the types and styles that we use today. 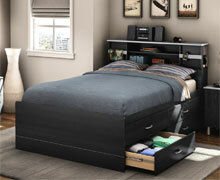 Not everyone wants or needs a bedroom set, or even a bed that requires a foot board. 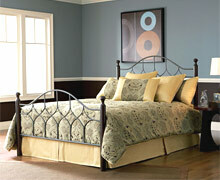 Some people choose to purchase a bed frame and then a decorative headboard. There are benefits to creating a bedroom this way. For one, if you already own the bed frame, just purchasing a headboard can be considerably cheaper than purchasing an entire bed. Also, it makes redecorating a lot easier on the budget. If you feel the urge to mix up the look of your room and bedroom furniture, you could simply swap out the headboard and the room would feel as though it had gotten a complete make over! 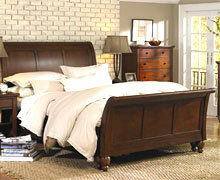 Decorative headboards come in as wide a range as typical beds do. You can purchase headboards in a variety of different materials and styles, anything ranging from ultra sleek modernistic to a more traditional look and feel. 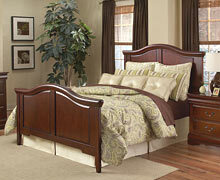 We offer wood and metal headboards in an array of shapes from simple rectangular to gorgeous arcs, arches and curves. What's more, most of our headboards also come in a choice of sizes, so you are certain to find exactly what you need to suit whatever bedroom you are shopping for. 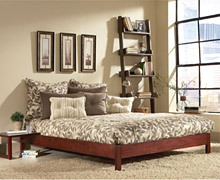 Shop our store for complete beds or simply headboards online.